There's nothing quite like a cozy sectional to warm you upon entry to the room. Ready to wrap you in the comfort of its contemporary design, the Connor Sofa Sectional is sure to delight the eye and relax the body. The Connor is custom made to fit the favorite room you like to settle into with loved ones. Cozy, supportive and with clean contemporary lines, this sectional sofa is truly sensational. Connecting a sofa and chaise lounge, there's plenty of room for snuggling down for your favorite movies, for lounging on a Saturday morning with your favorite read or for settling in for a nap when you need it the most. 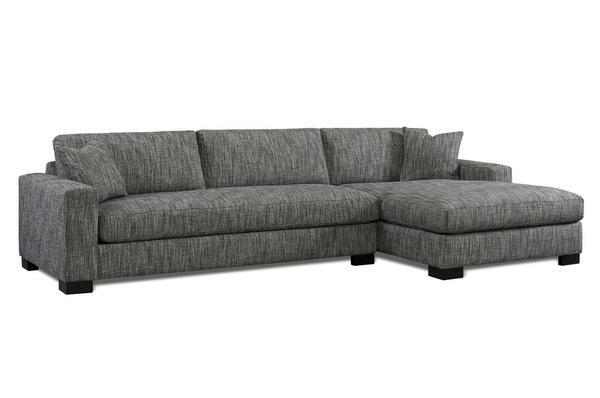 Modern and made with the finest materials, this sectional offers soft cell foam core back cushioning and sectional connectors for added sturdiness. View the Connor Chair that brings its unique shape to complement any contemporary decor. This is a custom sectional to curl up and take a nap on. Offering maximum comfort, there are options when selecting your sectional cushions. Opt for a combination of foam and down or spring and down to create just the right level of plush. Spring options include either a standard spring or firm spring. Choose the finish and seat cushions for this sectional sofa and choose from a wide variety of custom fabric options. Be sure to browse all of our contemporary sectionals to find the shape that best fits your home decor. Bring home quality you can count on from DutchCrafters. See what customers are saying about our custom furniture in this testimonial video.